Today's mission is to declutter toys, and you should start with the easiest first. That is the broken toys, and also those that the kids have outgrown. This mission is designed to be done while working on the Organize Toys & Games Challenge here on the site, which is part of the 52 Week Organized Home Challenge. Of course, as always, you can do this mission whenever you really need to. 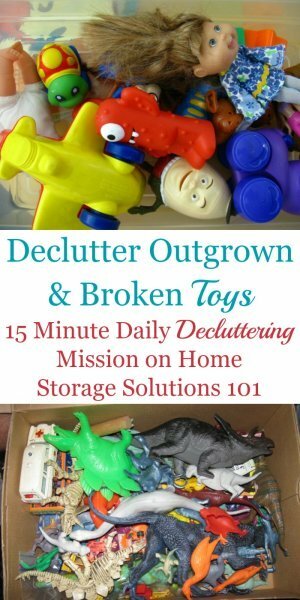 I understand that getting rid of toy clutter is not going to be something that takes only 15 minutes, total, if you've got any really great amount of it accumulated. That's why this is a really more of a 15 minutes at a time task, and if you look at the full declutter calendar for this week, as we focus on toys and games, I've got the task separated out onto several days as well, focused on different categories on different days, such as toys with small parts, those in toy bins and boxes, and specific types of toys, such as stuffed animals, games and puzzles, video games and electronic toys, collections and collectibles, etc. 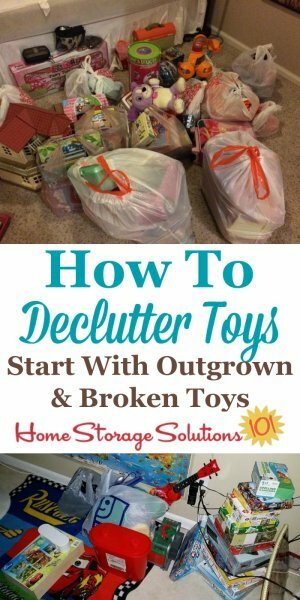 However, I understand that for many people, and their kids, starting the process of toy decluttering can seem overwhelming, like you don't know where to start. 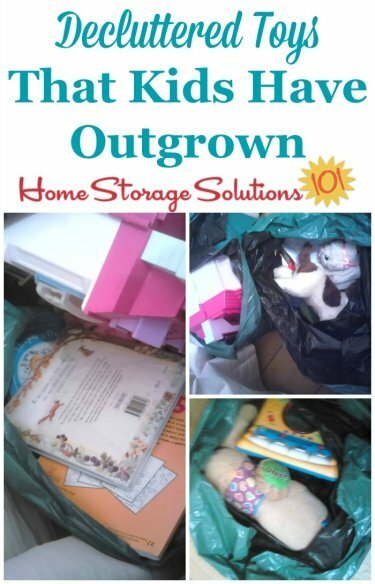 This is especially true because I recommend that if your kids are old enough, they need to be involved in the decluttering process. have their stuff decluttered for them, and we should give them the same courtesy we do to others we love. But in addition, learning the process of decluttering, of being able to identify what we can get rid of and what we should keep, will be helpful as a lifelong habit and skill, so best to learn now! But that still doesn't always help when you need to get started, and feel like it's hard to decide. My philosophy is not to overthink too much, but instead that starting, itself, can help you a lot with the whole process. So as I mentioned at the beginning of this mission, today's task is relatively simple. 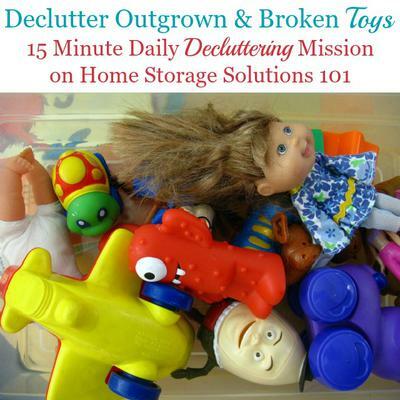 Today, focus only on decluttering broken toys, outgrown toys and baby toys. These categories are what I call the low hanging fruit -- the toys everyone knows they should get rid of. This includes anything your kids no longer play with, or stuff that doesn't have all its parts, or toys where all your kids have passed that developmental level should easily get out of your home. This will hopefully give you some momentum when you need to start tackling some of the tougher choices later as we continue to focus on kids' toys and games. To get you motivated I want you to check out some of the photos below, shown by other readers who've already done this mission, to get you inspired! Here's photos sent in by readers who've already done this mission, to show you what they've accomplished, and get you inspired about what you too can accomplish when you tackle this task. 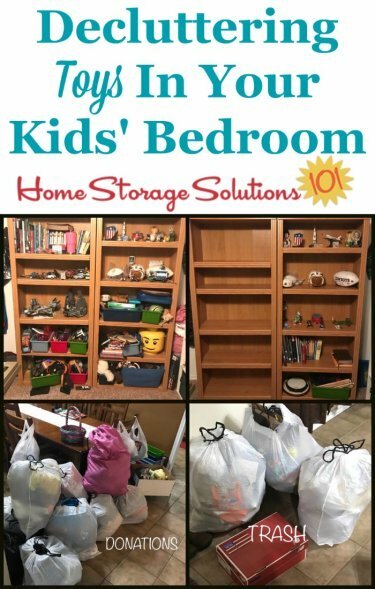 The photos above were sent in by a reader, Ashley, who said, "It was time to purge my now teenage son's room from all the toys. I spent about 8 hours yesterday purging everything from the dresser, to the closet, to the toy box. It is such an amazing feeling!!!" Here's another collage from a reader, Nikki, who worked on her kids' playroom. She explained, "I brought out all of the kid's toys into the living room. We kept only what could fit into their storage bins and shelf. 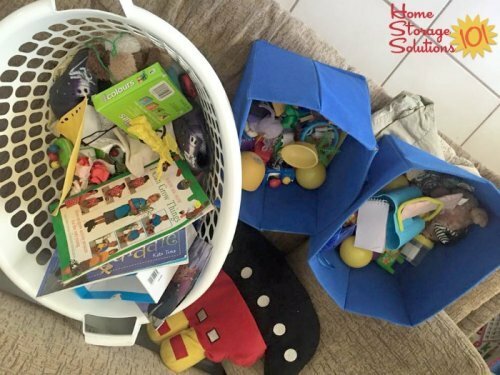 The kids did great with donating old toys and organizing their favorite toys." Once you're done getting rid of toys, you'll have a lot of bags or boxes to take out of your home. Just like the two photos above, sent in by readers. The first of these was sent in by Julie, and the second by Salasa. Remember, that until you actually remove the bags and boxes from your home, by either donating, selling, or trashing items, you haven't finished the decluttering process! Here's more photos of bags of toy clutter that a reader, Jennie, got out of her home. She explained that she knew it was more than time to get rid of these items from her home because they were the grandkids toys, and they were all grown up now. 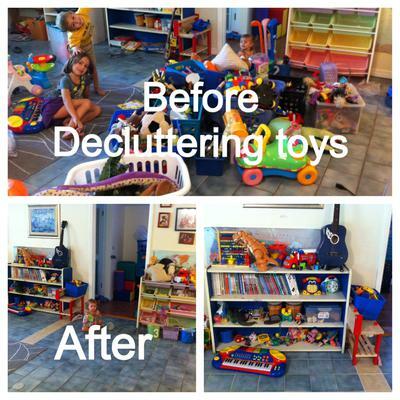 Are You Ready To Get Rid Of Toy Clutter? Finally, here's one last photo sent in by a reader, Amy, who culled the toys of her three young kids as part of these missions. 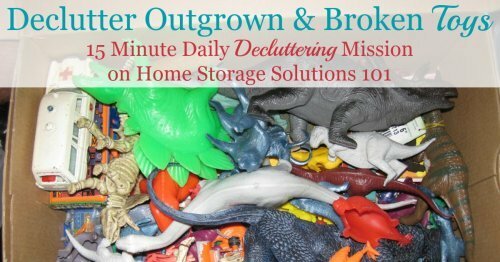 I hope seeing these pictures has inspired you to get rid of your toy clutter. 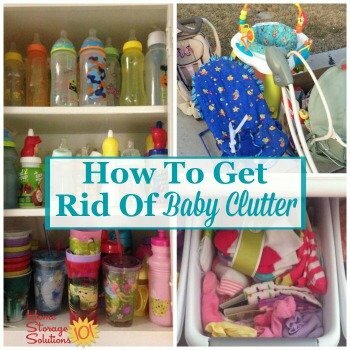 In addition, here are tips for how to get rid of baby clutter throughout your home.